So we went to a game. 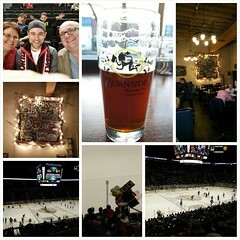 Portland Winterhawks v Seattle Thunderbirds, the local derby here with intense rivalry. Note this is not the NHL but a division of the Canadian Hockey League. What we did was befriend our local barman, Ian, who also cooked us our first bagel breaky, and worked a plan where we bought his ticket in exchange for him escorting us and explaining things. Ian explained the best seating to try and obtain so off we went a few days before to grab them. This worked out extremely well and Ian was a great guy and good host. So after meeting up at the Rusty Nail, our local, Ian bought us our first drinks and discussed the plan of attack. From here we would head over to Burnside Brewing for another drink then on to the game. Finishing our drinks Ian ordered and paid for the cab over to Burnside. At Burnside Ian again paid for a round and another cab to the game. I told you he was a great guy and host. 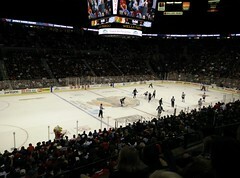 The game was at the Moda Centre. As sporting venues go this place was awesome. Well laid out, lots of good food options, and most importantly craft beer on tap!! Take note Suncorp, you don’t only have to serve that under strength goats piss called XXXX and serve junk food at exhorbiant prices. Here at the Moda we could choose from 4 draft beers, various wines, and even whiskeys or bourbon. Food was a wide variety of everything from the traditional hot dogs through to large fresh made pizzas slices, (which we indulged in) and even one of my new favourites, Salt & Straw Ice Cream had a stand there. So with beers in hand we found our seating. Ian was most impressed by our ticket selection, the seats were great with an excellent view of the whole playing area with no hindrances. But alas we made our first mistake here (well Ian did he guided us to our seats) and sat in some season ticket holders area, we were off by a few rows. But after a quick shuffle to the left our new seats were still sensational. Here’s a couple of views from them. Not knowing what to expect we awaited the “drop”. This is where the umpire drops the puck between the 2 teams and off they go. The game is played in 3 x 20 minute periods with 10 minute breaks between. I was expecting, (hoping for) lots of fights as shown on any vision I had ever seen of Ice Hockey. But this was not to be. The umpires broke up everything before it could get started. Never the less it was a very entertaining game. During breaks in play and between periods there was plenty of entertainment as the “Megatron”, this huge 4 sided screen in the middle of those pics, focused on various people in the crowd. Sometimes it was a Seattle supporter and the some creative genius in the production room put up some very funny thought bubbles, basically taking the piss out of them. And for an interesting Australian link, when the Winterhawks score they play AC/DC TNT and all the supporters stand and pump their arms shouting in time, Oi Oi Oi. Ali got right into this. Another fun thing they do is when a player scores a hat trick everyone throws their hat on to the ice. We were lucky enough to witness this as one of their star players scored a hat trick and the hats, caps and beanies went flying. They actually stop the game while the attendants come out with bags and collect them all. Don’t know what happens to your cap or if you can get it back so if you go wear an old one. After 3 exciting periods our new home team prevailed 7-1 and we strolled home with Ian across the Steel Bridge for a couple of night caps. All in all an excellent night and we would highly recommend it if you ever get the chance.